Football fans are still celebrating the return of the NFL to Los Angeles, but the FAA has some serious questions about how the proposed Inglewood stadium could impact the safety of airplanes approaching nearby LAX. "The structure is presumed to be a hazard to air navigation," says a November 2015 FAA memo obtained by the NBC4 I-Team. The memo says the height, shape, and materials to be used in the proposed building could interfere with radar signals being sent from the LAX control tower to incoming planes. That opinion was seconded by Michael Barr, a world-renowned aviation safety expert with USC. Barr told the I-Team that radar signals move in a straight line, and if they hit structures such as the proposed stadium, those signals may be impaired. Quiz: How Much Do You Know About the LA Rams? "As for safety concerns, in its present plans, I will bow to the FAA experts and agree it would be a hazard," Barr said. The FAA must approve the stadium plans for the project to move forward. The FAA memo says the stadium’s proposed height — up to 164 feet in places — should be reduced to around 50 feet. 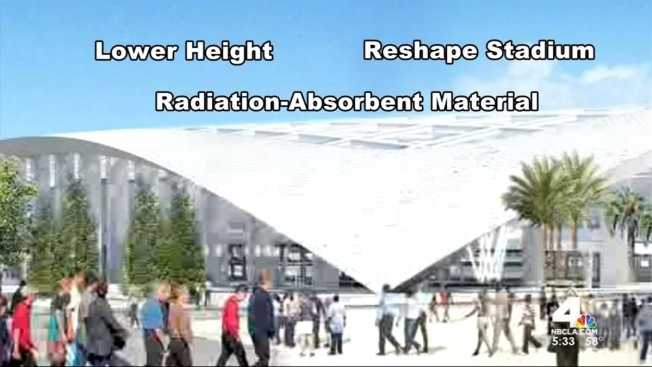 The FAA also recommends the designers retool the shape of the face of the stadium and use "radar absorbing materials" as a coating on parts of the structure. FAA spokesman Ian Gregor told the I-Team "the project is now in the negotiation phase between the FAA and the proponent. Once the negotiation phase starts, there are no specific deadlines for completing it." Aviation expert Barr told the I-Team, "I think the builder will submit new plans that will include one or more of the FAA's mitigation recommendations and then the construction will be approved and construction will begin." Inglewood’s Mayor James Butts says he’s confident the owners of the new stadium will work out all issues with the FAA.